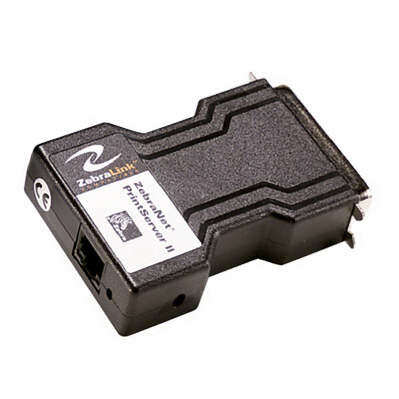 ZebraNet PrintServer II is ideal for desktop printers on a 10Base-T or Novell® IPX/SPX network and offers easy remote management for ZPL-based printers via Zebra printer management. ZebraNet PrintServer II is ideal for desktop printers on a 10Base-T or Novell® IPX/SPX network and offers easy remote management for ZPL-based printers via Zebra printer management. It is available in an internal version that provides a static footprint or an external configuration, which conveniently connects to the printer's parallel port and obtains power directly from the printer—external power supplies not required! Questions about the ZebraNet PrintServer II? We can help. For more information about the ZebraNet PrintServer II, or any of our products and services, call us at 1.800.457.8499 or email us. Order your ZebraNet PrintServer II today. Order your ZebraNet PrintServer II now. Your purchase order, with credit approval, is welcome, as well as all major credit cards, PayPal and Google Checkout. Remember, you'll get FREE technical service with every product you buy from Vecmar.